I hope everyone had a great Christmas and New Year! My Christmas was very relaxed, just how I wanted it. I ended up eating way too much to the point I felt physically sick, but then I guess it wouldn’t have really been Christmas if I didn’t… Christmas afternoon my brothers and I did do a long ride with our new bikes - long for me (about 6km with more wheelies and trying to do tricks than actual riding) to try and work off some of those Christmas calories. Every year, most swimming coaches give their swimmers a super hard session the day before Christmas that is known as their Christmas session. Mine was a 15.5km session (50m pool). 30x500… 10 on 6.15, 10 on 6.00, 10 on 5.50 (there was no extra rest between each 10). The last was max effort. I went 5.32. That was followed my 3x100 fast on 1.30, I held 62, 62 then 61. That was followed by 200 swim down, then a four hour sleep! The whole week before New Year’s I was adamant I wasn’t going to go out partying, instead opting for an early night - but come 9.30pm New Year’s eve, I got dressed and headed to my buddy’s house - Sam Speechly. We cabbed it to the city to party - it was a really good night! My first race of 2012 was the Dicky Beach Ocean Swim on the 3rd of January. It was just a 2km race and the field wasn’t great, but a win’s a win. 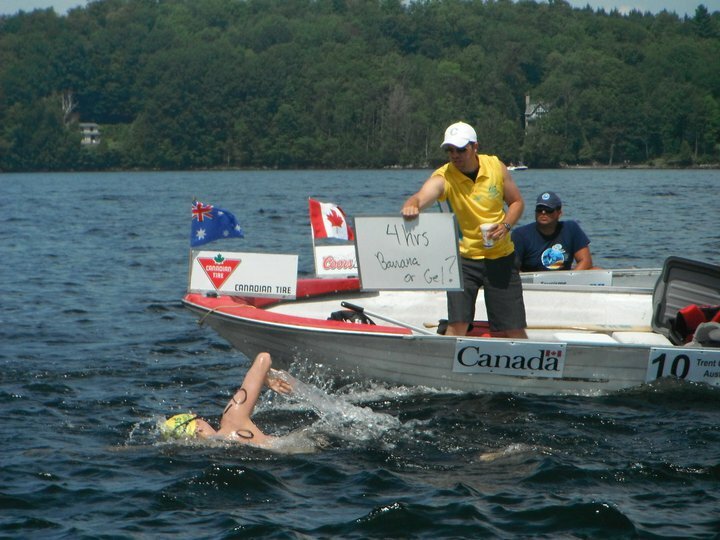 My second race of 2012 was the New Zealand Open Water Nationals that were held in Lake Taupo (11th of January). Because none of New Zealand’s open water athletes made the cut for the first Olympic qualifier, they still have a chance to qualify at the second qualifier in a couple of months’ time. This is why Swimming New Zealand decided to put up $5000 for the winner of both male and female 10km races. They wanted to attract more competition to compete against their best in a hope it would make for a better level of racing. Conditions were very tricky and with the water being 18 degrees it made for a very tough race. I ended up winning with the top New Zealand swimmer Kane Radford coming in second. Kane and I swam together for the first 7.5km of the race before I managed to open up a 3 minute lead on him in the last lap. Kane will now get a chance to qualify for the Olympics at the second qualifier in Portugal in a couple of months’ time. On the same day there was an amateur race held on the same course, in which a man lost his life. My thoughts are with his family and friends at this time. The rule for the Open Water Olympic event is that the field can only have 25 athletes and not necessarily the best swimmers in the world are in that field, but that as many different countries as possible are represented. In the mens field for the London Olympics, Germany and Russia will be the only countrys with two athletes in the field. As I was not well at our Australian trials (in February 2011) when our team was being picked to compete at the first Olympic qualifier in Shanghai, I was not selected by Swimming Australia to race at that event in which another of my countrymen Ky Hurst qualified -meaning no other Australian men could qualify. It must be noted that in the Olympics the running marathon (the equivalent to the swimming marathon) there is not a cap of 25 athletes in that event. In the 2008 Beijing Olympics there were 92 entrants in the running marathon in which 76 finished. This has me scratching my head as to why there is only allowed a field of 25 athletes in the swimming marathon… There needs to be a shakeup of the whole system in which at the Olympics you see the best verse the best, not just a field with a different swimmer from every nation. On the 23rd of January I fly to Argentina where I’ll be competing in two of the World’s longest marathon swims, one week after another. The first will be a 57km in Santa Fe-Coronda, the next an 88km in Hernandarias- Parana. Even though I have never raced distances like these before, I think I will swim very well. I’ve talked with a few of my friends who have raced these races before and have been given some great advice. For these races I’ll be having Mario Geijo as my feeder/coach and I’m very excited to be working with him. Mario has been involved in these races for many years and his experience will be invaluable. I’ve had a good start to 2012 so far and can’t wait to race in Argentina. I’m pretty sure I’ve covered everything. Feel free to leave comments and I’ll try and get back to you as soon as I can. I have to go, I don’t want to be late for my Pilates class! "Challenge the known and embrace the unknown"